Use the guide posted below to learn how to submit the official State of California job application online for numerous types of careers. The State of California employs individuals across a wide range of industries. Follow the steps posted in the guide below to learn more about the online job search/application/hiring processes. About the Hiring Organization: The State of California employs tens of thousands of individuals in numerous different fields. Employees have access to numerous benefits programs (healthcare, different forms of insurance, etc.). 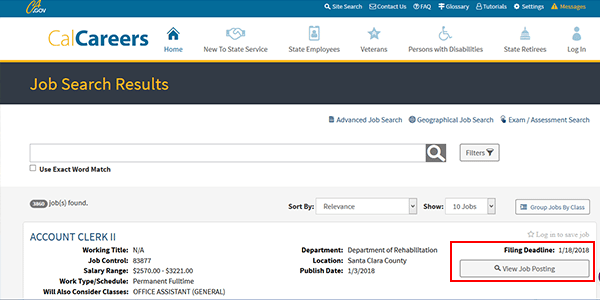 Step 1 – Click this link to open the State of California’s employment site in a separate browser window/tab. Step 2 – Use the input field (outlined in the below screenshot) to search the entire list of current openings (by keyword/job title). Press the search icon/button to load the list of results. Step 3 – The list of results can be sorted by relevance, classification, deadline, salary, etc. Click the “View Job Posting” button of the specific position that you’re interested in applying for (to learn more about the job’s requirements, responsibilities, etc.). Step 4 – Read the complete description of the position, and then click the button as outlined in red in the below screenshot to move to the next step of the process. Step 5 – Complete the job eligibility step by determining whether or not you are eligible to apply for the position. Step 6 – If you are eligible, click the button as shown in the below image to go to the next section of the form. Step 7 – Press the “Create Account” button to go to the account creation page. Click the “Save” button at the bottom of the form to save/create your account details.